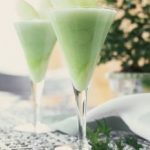 These green smoothies combine the delicious flavors of pears, kiwis, and cilantro. Cilantro does have an intense taste, but the natural sweetness of the pears and kiwis help to offset this taste. 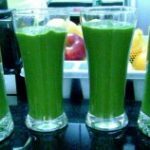 Additionally, the taste of the fruit will prevent you from even tasting the radish greens that are included in this smoothie. Radish greens have a very mild flavor anyways, which makes them a perfect leafy green vegetable for your smoothie. 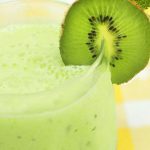 If you aren’t familiar with them, kiwis are an excellent source of Vitamin C. Their seeds are edible, and they should be included in your green smoothie. The seeds also contain healthy Omega 3 fatty acids. In the skin, you can find a number of antioxidants that are also beneficial to the human body. 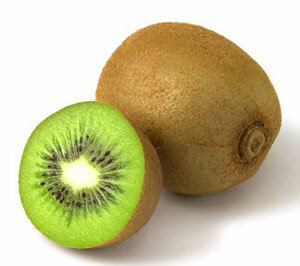 Like we’ve talked about before, kiwis also contain an element called actinidin. 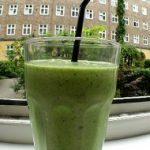 This enzyme helps the human body to break down proteins, so these green smoothies offer the perfect opportunity to add a scoop of protein powder to your smoothie. In a similar fashion, pears are an excellent source of dietary fiber. Two of the best health benefits of pears are that they help promote cardiovascular health and colon health. Additionally, regularly eating pears can also help protect your body against age related macular degeneration. 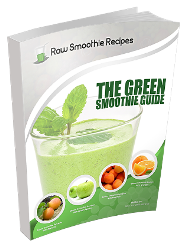 These are the ingredients you’ll need to make these green smoothies. Add the liquid to your blender first. Next, add in the soft fruits. The leafy greens should be added last. All of these ingredients should be blended together on a high setting for about 60 seconds. 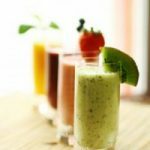 If you want to give your smoothie more of a tropical taste, then you can substitute the purified water with about 8 ounces of fresh coconut water. These green smoothies are going to be a good source Vitamins K and E, copper, magnesium, phosphorous, and magnesium. 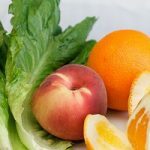 This recipe will make about 32 ounces of smoothie, but you can easily double the ingredients or cut them in half, depending upon how much smoothie you want to make.